Rahul Gandhi claimed victory and said the Congress will abolish the multi-slab system introduced by the BJP and simplify it to just 18 percent tax after coming to power in 2019. 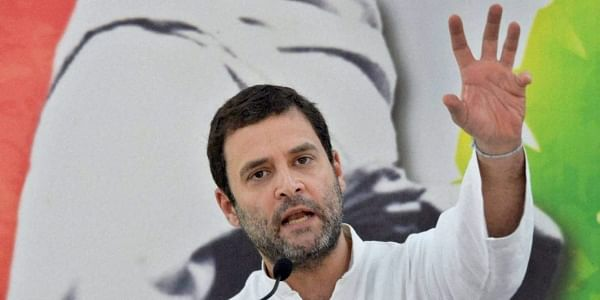 NEW DELHI: A day after GST Council reduced tax on 178 essential items, Rahul Gandhi claimed victory and said the Congress will abolish the multi-slab system introduced by the BJP and simplify it to just 18 percent tax after coming to power in 2019. "India does not need a Gabbar Singh Tax. We want a true GST. Congress, along with the people of India, fought for and insured reduction in items in 28 percent bracket. Next we will fight for one rate, with a cap at 18 percent. If BJP doesn’t do it, Congress will,” Rahul tweeted on a day he launched phase four of his Gujarat campaign in Ahmedabad. Rahul has been raising the faulty GST to target the BJP in Gujarat based on internal reports that the issue has a strong resonance among voters in the poll-bound state. Noting the reduction in tax rates had vindicated the stand taken by him and his party, former prime minister P Chidambaram too said the Congress’s next goal will be to push for a single rate GST. “Congress is vindicated. I am vindicated. The merit of capping GST at 18 percent is now recognised. When GST rate is capped at 18 percent, this government would have learnt its lesson belatedly,” Chidambaram tweeted. Congress is vindicated. I am vindicated. The merit of capping GST at 18% is now recognised. The former FM thanked Gujarat polls for the government’s step down. Thank you Gujarat. Your elections did what Parliament and common sense could not do. An upbeat Congress rushed to credit Rahul Gandhi for the victory. “Persistent pressure built by the Congress Vice President Rahul Gandhi and the Congress party forced the GST Council and the BJP Government to reduce taxes on items of daily usage being taxed under the 28 percent bracket,” Congress communication department chief Randeep Surjewala said in a statement. The people, particularly shopkeepers, traders, MSMEs, are distressed with the lopsided architecture, design and implementation mechanism of “Modiji’s ‘Gabbar Singh Tax’ (GST)”, he said. The Congress demanded inclusion of petroleum products, real estate sector and electricity under the GST ambit to widen the tax base and said the government must reduce the compliance burden.